Fit for Work in Europe - f4w-ineuropes Webseite! 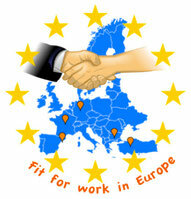 Fit for Work in Europe is an Erasmus+ project of five European countries developing the world of work in Europe. There were five project meetings taking place in four of the five partner countries and one further week of internships for some students. The contract for a project in the framework of the new EU education programme “Erasmus+” has been accepted. We are really excited! Together with project partners from Bulgaria, France, Turkey and Spain we will be working with around 50 students on the topic “Fit for work in Europe” for the next two years. We are fit for work in Europe!